The first day of our trip was spent meeting with TEAR’s partner organisation EFICOR to discuss the projects we were to visit in the following days. Four projects in three states over five thousand kilometres were on the itinerary: two newer projects which focused primarily on issues of HIV/AIDS and two agricultural and livelihood projects. Our first travel leg took us to Tirunelveli, a district in far-southern India. In Tirunelveli HIV is a major social issue. It’s hard to imagine life in a community where around 2% of people have HIV. It’s harder still to imagine what it might be like to live with HIV in a community that considers you an outcast. Add to this the health problems and their effects on one’s livelihood and one begins to scratch the surface of the reality. In the midst of such communities, however, there was hope. TEAR’s partners were working with churches to teach them about the realities of HIV, that the people infected are not dirty or evil, but that they are God’s children, and that the church is called to enact the love of God by caring for these people. Through such programs the church was being equipped to be a loving presence in a place of constant rejection. One young pastor by the name of Praveen told me that, like other members of his community, he once believed that people with HIV/AIDS were to be avoided and feared, that the infection was the result of a sinful lifestyle. “I was afraid to even enter the house of an infected person!” he recalled. 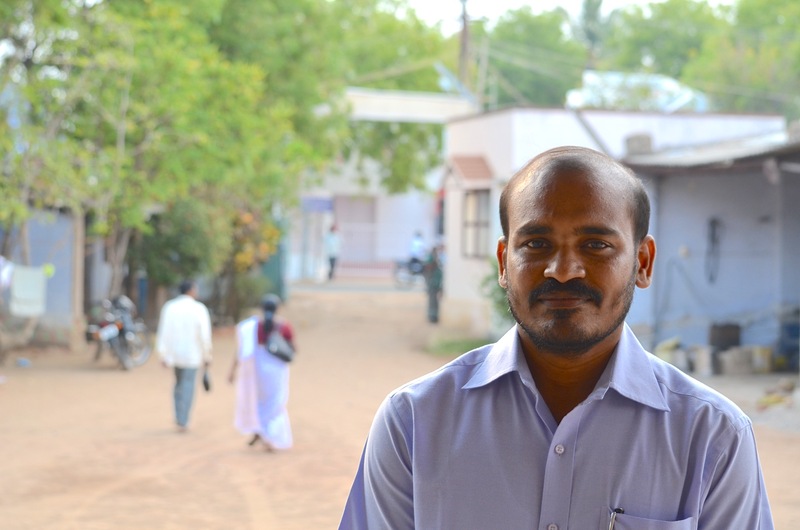 But through the training of TEAR’s partner Praveen came to understand that his beliefs were mistaken, and that people living with HIV are not to be feared, but to be embraced and cared for. Praveen’s church now provides care, support and empowerment for dozens of people living with HIV, and he and his wife run support groups for people with HIV in which they come together, host discussions, provide teaching and health information, and facilitate a financial savings program within each group. It was beautiful to see the Church acting in accordance with its call to follow Jesus in caring for the poor and marginalised. Like the stories of Jesus’ encounters with the sick teach us, the issue of healing is not simply about ending sickness, but also about opening up communities to embrace sick people. It wasn’t enough for Jesus to heal physically, he also insisted on ensuring that the wider community accepted the person as a valued member. It was fantastic to see these Indian churches not only meeting the physical needs of the people but also welcoming them into their midst, providing love and ongoing support as a family in Christ. The effect of the churches’ witness was that the stigma against HIV in the wider community was being reduced. It was in such a place that I was privileged to see the kingdom of God coming on earth as in heaven. Of course HIV does not simply affect those who are infected—it also affects those around them, especially children. A story from the second project of our visit illustrates this well. In the east-Indian town of Chirala we met Dhanalakshmi, a girl of 18 years of age. She lived with her mother, who had HIV, and her two younger sisters (17, 15). Simply put, Dhanalakshmi’s community was very poor. Before TEAR’s partner got involved in the community there was no secondary schooling. There was also a relatively high prevalence of HIV with no support for those infected and their families. Earning a livelihood was difficult for Dhanalakshmi’s family, especially with no father and a mother living with HIV. TEAR’s partner helped the community set up the means for children to complete secondary school. As a result Dhanalakshmi was able to complete her schooling and go on to university. At the end of 2012 she was in her first year of a Bachelor of Arts majoring in History, Politics and Economics. TEAR’s partner also helped the family set up a small sewing business as a way of earning income without needing to travel, a huge blessing for the mother. In addition to studying and working, Dhanalakshmi has also become a leader in her community, facilitating a support group for children affected by AIDS. The name of the group is Velugu, which in the local language means “light”. It has 20 members, ranging from first grade to first-year University, all of whom have been affected by HIV, either through infection or the infection of a family member. The group provides a place of care and support for the children. When asked what they liked about the group the children responded by identifying things like mutual caring, discussions and help with studies. The group also supports each other financially: they collect 1 rupee (AU$0.02) from each person at each meeting and are able to lend or give the money to someone in the group when a need arises. Such a story demonstrates well the power of working with communities, rather than imposing pre-determined “solutions” on them. TEAR’s partner worked with Dhanalakshmi’s community to find out what they thought should be done. More than this the community was also central in the planning, implementation and evaluation of the work. By doing this the result was a far more holistic approach addressing all the core needs and root problems identified by the people being helped, whether economic, political or social. It also meant that the community felt a sense of ownership of the work—it was fantastic to see that the self-help groups were almost entirely being run by people within the community. People in the community seemed genuinely energised by the work because they were empowered to take charge and be a solution to their own problems. Such ownership by the community also ensures long-term sustainability since the good work will not come to an end once the project is finished. In other words, empowered communities do not become dependent on foreign donors. The sustainable changes in people’s lives—people like Dhanalakshmi—as well as the improvement in the life of the community as a whole were evidence of the effectiveness of this approach to development. The fruit of this development approach were also evident in the final two projects we saw, both of which focused on agriculture and livelihood. In one of the villages we visited there were issues with the wealthy coming in and buying up the surrounding land and using it to grow cash crops. This had a severe effect on the agriculture of the surrounding villages because access to water for irrigation became difficult. Moreover the livelihoods of the villages were compromised because of increased pressure to grow cash crops. By working with this particular village TEAR’s partner EFICOR was able to help them establish a better irrigation system and more effective and reliable agricultural methods, both vital elements for their communal well-being and food security. Such stories were repeated many times over as village after village had their economic prospects and food security vastly improved by the holistic approach of EFICOR. In one place, Kandhamal, where violence had struck some villages in recent times, EFICOR was quite literally helping families to rebuild their lives, assisting those villagers whose houses had been burnt down to rebuild. EFICOR was also helping people access government benefits, including pensions and compensation for failed crops. This money helped countless people we met to invest in new vocational schemes. Some of the most popular investments were sewing machines for tailoring, equipment for manufacturing dried foods such as fish, and kitchen gardens for growing specialised crops. One group of women we met even saved up together to buy the equipment to start a wedding hire business, including tables, chairs and cooking equipment. Perhaps just as important as the meeting of physical needs was EFICOR’s supporting role in the ongoing peace process in Kandhamal. Such support was enabling communities to resolve their conflicts through activities such as peace meetings in the villages, organised rallies, sports events, and the development programs themselves. It is impossible to tell all the stories of all the fantastic things we saw throughout our trip, and what has been shared is only a fraction of the beautiful things we witnessed. Still, such stories testify to TEAR’s commitment to holistic development that deals with the whole person and empowers them to make the decisions necessary to come out of poverty. Even in the face of such poverty, we could not help but be struck by the kindness and hospitality of the people we met. Though they had little they were always willing to feed us far more than we could eat, give us far more than we could drink, and give us greater gifts than we ever deserved. Such was their generosity—how could a person be happy when those around them were sad? Such experiences of community and hospitality should cause us to question what is truly important in life. While the hardship of living in poverty and being unable to wield much control over the outcome of your own life is truly terrible, it is also true that people with far less than those of us in rich countries are often more content. Perhaps it is a reflection on the dangers of wealth—we have so much yet so often seem miserable and empty. Certainly development should not be about making poor people more like us; such would be a terrible mistake. On the contrary, good development is about working with poor communities to work out what they think they need to overcome poverty. The truth is that in listening to the poor we may discover things missing in our own lives. Compare Australia’s rate of 2.1%. Posted on January 9, 2013, in Development and tagged Agriculture, AIDS, Development, EFICOR, HIV, India, Poverty, TEAR Australia. Bookmark the permalink. Leave a comment.